Beers include Truth, Juicy Truth, Double Dry Hopped Juicy Truth, Coffee Uncle, #006 Experimental DIPA, Yellow Submarine, Cougar, Hustle, Zen, Fiction, Trips and Peach Dodo. Six samples and Jet’s Pizza. This week, it’s Revolution Brewing. Wing Eating, Tray Carry, Trivia, Frozen T-shirt and Bar Mug Slide. Hosted by the Kenton County Pubic Library, this month’s book is The Hitchhiker’s Guide to the Galaxy by Douglas Adams. From Facebook: “Eight Cincinnati breweries will square off in one-on-one amateur boxing matches in a professional ring under the big lights at the Fifty West Brewing Company Pro Works Facility located at 7605 Wooster Pike on July 9th, 2016. This week, it’s Dark Horse Plead the 5th & Double Crooked Tree. The cost is $5 for a ten ounce snifter. They will also be pouring Cougar, Mosaic and Semi Dry Cider. Pouring Rivertown’s Liquid Ingenuity Special release: Great Miami Hop Project Episode 1 as well as Winter Ale on tap and bottle pours of Lil Sipa, Death, and Jenneke. Beers include T-Bird Hop Harvest Ale, Altered Pale Ale and Shiver Chai Porter. The beers for this week’s Pint Night Thursdays are: Main Strasse Covington – Moerlein OTR, Glendale – TBA and Hyde Park – TBA. Featuring West Sixth IPA and Cocoa Porter. Keep the glass. We frequently get updates for our This Week in Beer post after our regular 9:00 am publishing time. Any edited listing will have UPDATE at the beginning of the listing. Check out our Better Beer Happy Hours, Etc. page for regularly scheduled specials on better beer. This week, there are two: Moody Tongue Caramelized Chocolate Churro Baltic Porter and Sliced Nectarine IPA. This month, it’s Slow Mow Pilsner and a dollar from every Beer of the Month sold along with 100% of the proceeds from the ceremonial keg will be donated to the Flying Pig Marathon. A portion of every pint of Old Firehouse will go be donated to fallen Cincinnati hero Daryl E. Gordon’s memorial fund. There will also be giveaways and other drink specials. This week, it’s Southern Tier Brewery. This week, it’s West Sixth. Beers include Burton Baton, Noble Rot, Aprihop, 90 Min IPA and Chateau Jiahu. It’s a vanilla brown ale. The beers for this week’s Pint Night Thursdays are: Main Strasse Covington – Rhinegeist Zen, Glendale – Smuttynose IPA and Hyde Park – 5 Rabbit 5 Lizard. From 4pm-10pm, $1 from any draft beer ordered will be donated to ArtsWave. Saturday, April 18th – Happy First Anniversary, Halfcut! Tap takeovers by MadTree, SweetWater and West Sixth. More information on their Facebook event page. We frequently get updates for our This Week in Beer post after our regular 9:00 am publishing time. Any edited listing will have UPDATE at the beginning of the listing. Check out our new Better Beer Happy Hours, Etc. page for regularly scheduled specials on better beer. Postponed from last Monday – Samuel Adams Stout on Nitro to mix with your favorite craft beer. Angry Orchard also goes well with this stout if you like snakebites. Eight beers (six from Rogue and two from BJ’s), four courses for $30 for prepaid reservations, $35 day of event. Reserve online at their web site. This same dinner will be held at the Florence location on Monday, March 2nd. This week, it’s MadTree at their Lakeside Park location and Rhinegeist at their Florence location. This week, it’s their Belgian Fest. This month, it’s their Doppelbock AND, as of last week, smoking is prohibited indoors at Hofbräuhaus Newport. It’s allowed in their beer garden now. The beers for this week’s Pint Night Thursdays are: Main Strasse Covington – Kentucky Bourbon Barrel IPA, Glendale – Listermann NutCase and Hyde Park – Revolution A Little Crazy. Rescheduled from 2/16 — An unique eating competition – 10 wings drenched in Holler’s death sauce and a glass of Rivertown Death. All participants will receive a t-shirt and the first person to finish will win a private tour at Rivertown. From the Facebook event page: “The annual celebration will be centered on the release of the brewery’s first ever 22-ounce “bomber” style bottle of a limited-release beer name Eleven/162. Eleven/162 is a smooth, malt-driven Scottish Wee Heavy Ale, meticulously aged for three months in Smooth Ambler Bourbon Barrels.” Limited quantities of wax-dipped, hand-numbered bottles of Eleven/162 will be released for purchase at 6:00 pm. Eleven/162 will be on tap alongside the last keg from last year’s anniversary limited release, Ten/161. There are also plans for numerous specialty infused kegs and casks to be on tap throughout the evening. Postponed from last Saturday – More information available on their Facebook event page. More information available at their Facebook event page. See Friday’s Cincinnati Beer Week Events post for the listing of events happening all through Cincinnati Beer Week. We know you like beer, but do you like team trivia? Want to try a special beer themed team trivia competition? Join us at the Christian Moerlein Brewing Co. Malt House for Hoperatives Beer Trivia as well as a special keg tapping of a super hopped specialty release. Beer trivia starts promptly at 5:30 pm and will wrap up in time for the regular trivia at 8:00 pm. Come join us and win some prizes! Featuring cans from MadTree, Jackie O’s, Revolution and Sixpoint. Each can is $3.50. Featuring beers from Southern Star Brewing Company of Texas (Bombshell Blonde and Buried Hatchet Stout) plus Prairie Artisan Ales of Oklahoma (Prairie Standard and Funky Gold Amarillo). Samples are 25 cents each. Deschutes Brewery ans Mavericks Chocolate Co. Beers on draft include Black Butte XXVI, The Abyss, Red Chair NWPA (Nitro) and Fresh Squeezed IPA. Two wings, tossed in four different sauces and paired with a different beer. Total of eight wings in four different sauces plus four samples of beer for $15. All ages allowed to attend, but only 21 and up can drink. Pints are $3. Includes their Maple Dopplebock. Beers from MadTree include Vernal Beckoning, Funke Blue, Mo’Coe, Barrel Aged Gnarly Brown, Sprye and PsycHOPathy. Rhinegeist beers include Mastodon, Pandamonium, Alice, Powder and Truth. Beer Reception; First Course – Tarnished Golden Ale ABV paired with scallops, Mediterranean beet salad, peach salsa, tangerine lace; Second Course – Reintarnation Golden Ale paired with pate faux gras, fennel gelee, sour onion relish; Third Course – Red Drink Imperial Red Ale paired with petite BBQ, smoked cornish hen, baby kale, baby corn, couscous, macaroni and cheese; Fourth Course – 4Some Belgian Quad paired with cold smoked buffalo tenderloin, sweet potato risotto cake, pomegranate sauce, 4Some jelly, heirloom spinach; Dessert – Home Alone Milk Stout paired with hazelnut mousse, chocolate cup, almond milk chocolate sauce. Beers on draft include Zombie Dust, Gumball Head and Backmasking. Beers include Lift, Black Tart, Psychopath and Rubus Cacao. They will also giving away glassware. Beers available for blending are Listermann Nutcase, Triple Digit Chickow!, Mt. Carmel Coffee Brown, MadTree Happy Amber and MadTree Gnarly Brown. Cincinnati Beer Week BlackTart will also be available. “Become a Hop Expert. Okay, so that beer is “hoppy” – but, what hop is it and what are you smelling and tasting? Danny (BeerMumbo.com) and Mike (BrewProf.com) will lead you through an exercise to isolate five different specific hops so you can learn about the differences between hop varieties. Each single hop sample will be paired with a commercial example of a beer that features that hop. In just an hour, you will become a hop expert!” The cost is $30 per person. Go to https://brasstap.webconnex.com/hopclass to make your reservations (required). Use coupon code BRASSTAP to get $5 off. Four Blank Slate beers (including one that may be new) and a three course meal. Menu is beer battered crudites with kimchi tarter sauce paired with Blank Slate Kolsch; “Beer” Mac n Cheese made with Pat’s RIP n Kolsch and paired with Fork in The Road; Blank Slate’s “Fume” braised beef, root vegetables, and horseradish mashed yukons with Movin’ On; and “Opera Cream” Bonbonerie coffee milk stout Creme brulee with Opera Cream Stout. Call 613-861-2484 as reservations are required. Other Rhinegeist gear available as well. Trivia plus Warped Wing’s Ermal and Hop Smuggler. 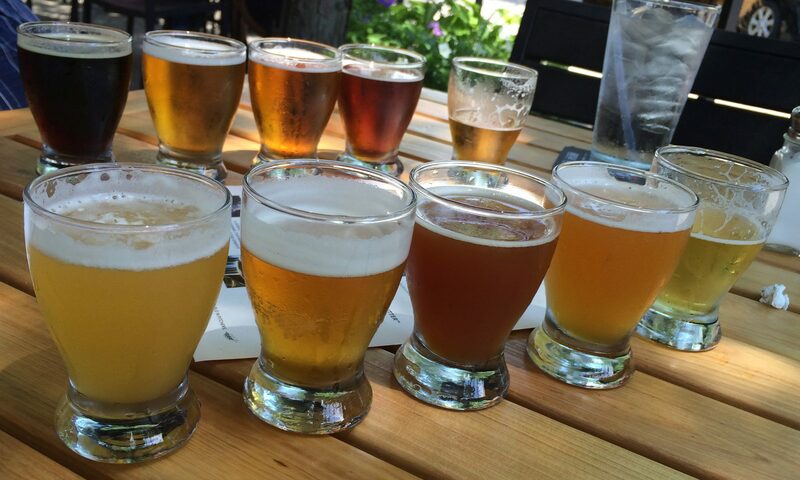 Custom craft your flight and choose any four tasting sized beers for just $8. Beers will include West Sixth IPA, Amber, Pay It Forward Cocoa Porter, Belgian Blonde, Heller Heaven Double IPA, Burley Barleywine, Saison Bellaire and Barrel-Aged Cocoa Porter. Beers will include Live and 2XIPA. Samples are 25 cents each. Schelde is a Belgian Pale Ale and Son of a Birch is a Belgian Strong Dark Ale infused with birch bark chips. Beers from Fat Head’s (Head Hunter, Barrel Aged Battle Axe, Hop Juju and Zeus Juice) and MadTree (PsycHOPathy, Sprye, Rubus Cacoa and Black Tart). $10 flights, $4 glass pours and $10 growler fills. They will also be tapping a special Christian Moerlein/Growler House collaboration cask. Beers include Orval Trappist Ale, Westmalle Trappist Ale Dubbel, Chimay Peres Trappistes Ale Tripel (on draft) and Trappistes Rochefort Belgian Ale #10. Cost is $15.00 per person. Beers include Barrel Aged 72 Imperial, Barleywine, Nitro Vanilla Porter, Agave Wheat and Avalanche. Tapping Hop Henge Experimental IPA & Red Chair on Nitro. Join Listermann/Triple Digit assistant brewer Josh Elliott as Lucky Dog pours Planetary Eclipse, Lateral, Cranium and a variation of Chickow! to be determined. Pairing: First Course – Smoked wings, Second Course – Smoked Brisket with Baked Beans, Third Course – Layered Crepe Cake w/ beer infused sweet pastry cream. Call 513-204-5825 for reservations. Featuring Bad Tom’s Russian Imperial Stout and Old Abe. They will be giving away glassware. For this five course beer and food pairing, arrival time is at 6:30 pm with dinner starting at 7:00 pm and going until 9:00 pm. Three course meal with Madtree Funke Blue, Rubus Cacao and Sprye. A special MadTree beer will get the dinner started. Five selections on tap from each New Belguim and Blue Moon, including limited/rare brews and some are exclusive to this event. Twenty beers to taste. Ten of them paired with a unique food item. Beers from Alltech, Upland, Rivertown, Blank Slate, West Sixth, Deschutes, Brooklyn, MadTree, Rhinegeist and Ei8ht Ball. Cost is $30 per person. Email Josh at Josh@mollymalonesirishpub.com or call 859-491-6659. Beers include Two Hearted, Oatmeal Stout, Smitten and Hopslam. Blank Slate/Oskar Blues tap take over including their collaboration Cincy 3-Way Porter Also tapping Blank Slate Bonbonerie cream stout, Fork in the Road plus Oskar Blues Dale’s Pale Ale and Old Chub. Sampling beers from the Five “Founding Fathers” – Red Hook, Widmer, Sierra Nevada, Anchor Steam and Sam Adams. Available for pints or samples only. Buy a pint of Rivertown Dunkel and keep the glass. 15 local brews featured on draft include: MadTree PsycHOPathy, MadTree Axis Mundi, MadTree Born to Be Mild, Rhinegeist Truth, Rhinegeist Steve, Rhinegeist Cougar, Rhinegeist Knucklehead, Blank Slate Movin’ On, MadTree/Listermann Madmann Cranberry Gose, Mt. Carmel Amber, Mt. Carmel Winter, Bad Tom Brother Clement, Fifty West Dipstick, Fifty West Jalopy Nose and Rivertown Lil Sipa. Plus half price wings from 5:00-10:00 pm. Rescheduled for tomorrow night (Tuesday, Feb. 17th). New Belgium pints for $3. Oskar Blues Ten Fidy ’12, ’13 & ’14 as well as Blank Slate/Oskar Blues 3 Way Porter plus Blank Slate Bonbonerie Opera Cream Stout. Join MadTree co-owner Brady Duncan as Lucky Dog pours Sprye, Rubus Cacao, Barrel Aged Olde Battering Ram, Gnarly Brown. Pairing: First Course – Gnarly Brown and Bourbon Meat Balls, Second Course – Pulled Pork Sandwich with Coleslaw, Third Course- Bread Pudding with Rubus Cacao Caramel Sauce. Call 513-204-5825 for reservations. Rubus Cacao, along with Spyre, Happy Amber, Psychopathy, Gnarly Brown & Lift. Rescheduled for Thursday, February 26th at 6:30 pm. This event has been cancelled and will be rescheduled for a later date. Featuring Alltech’s KY Bourbon Barrel Ale and Ei8ht Ball Brewing. Winner of the live band karaoke contest gets 10% of day’s proceeds donated to the charity of their choice. They will also have MadTree Spyre, Happy Amber, Psychopathy, Gnarly Brown and Lift. They will be tapping Maple Doppelbock as well as Mt. Carmel’s Coffee Brown. Will also be giveaways and their New Orleans inspired Sunday Brunch menu will be available. Featuring Tank 7 and 80 Acre. From the event organizer – “Babes & Beers is a social networking group for women that uses the love of craft beer to tie us all together. Come out, have some brunch, make some new friends, and take part in a truly original small batch experience.” We hear that the small batch beer may be a honey-lavender pale ale. Email becca@fiftywest brew.com to make your reservations. Also a meet and greet with featured artist/photographer Lynn Ayers. Meet the brewer/owners of Old Firehouse and try four of their brews: Code 3 Red Ale, Hoser Gose, Flash Point IPA, and Probie Porter. Learn how to host a beer dinner with Chef Lee Moeller of Moerlein Lager House. Topics include pairing, cooking and presenting. Cost is $25 per person. Contact Jeff Geckle at jgeckle@moerleinlh.com for reservations.